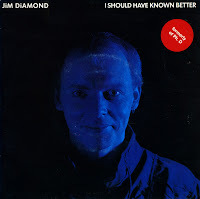 Jim Diamond was born on September 28, 1953 in Glasgow, Scotland. His big break came in 1982 as part of the band Ph.D. After this band folded, Diamond went solo. He recorded the sloppy ballad 'I should have known better', which became a UK number 1, and also reached number 3 in the Dutch Top 40. When 'I should have known better' reached number 1 in the UK, Band Aid just released their charity single 'Do they know it's Christmas?'. He requested publicly that people not buy his single, but instead buy that single.